Although pea gravel, the 10mm option, is appealing it cannot withstand traffic without suffering from swifter compaction; choose a 20mm gravel to enjoy greater texture and a more satisfying crunch. In icy weather it is much easier for the smaller gravels to be coated and to become slippery as they lie flatter. The larger gravel does not provide a sheer surface for ice or frost to cover it so there is automatically greater grip under foot and wheel. Angular chippings rather than smooth shaped gravels maximise safety. The noise of gravel underfoot alerts property owners to another’s arrival. This is a security benefit which many overlook but it does help to prevent incidents. Gravel is one of the easiest landscaping products to install and low maintenance. The occasional top up, rake over and weeding task are its only demands. A weed membrane fitted beneath the gravel ensures you have more free time; who wants to be weeding when you can relax instead? Installing Core Path robust but discreet gravel framework attached to weed matting saves even more time. Core Path sheets maintain gravel path tidiness and aid weed control. The low costs of these ancillary products makes them a must-have. Gravel for paths is available from leading gravel suppliers including the renowned Rivar Sand and Gravel based in Newbury, Tadley, Hare Hatch and Windlesham. For small DIY projects a 25kg bag may be sufficient but the 20mm gravel bulk bags deliver excellent value for money, greater depth and additional chippings for top ups. Note: gravel from the same batch blends well but a separate batch can be surprisingly different and creates discord within a design scheme. Of the numerous 20mm gravel bulk bags gravels for paths, one of the most versatile is Cotswold Chippings; a sublime classic local gravel in 20mm angular buff-yellow chippings which enhances any space. 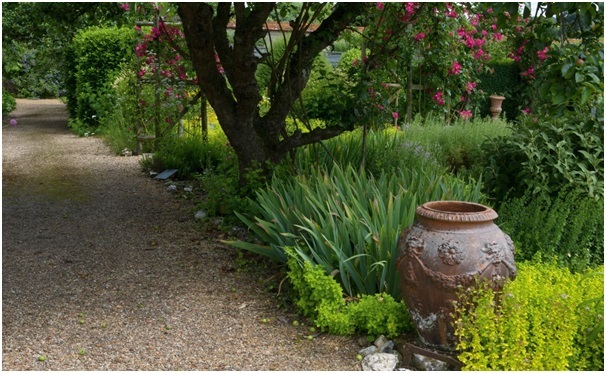 Don’t just use Cotswold Chippings for your path, add continuity by employing them in entertaining, seating and dining spaces, around features including statues and ponds and as a mulch over pots and flowerbeds. Why not call in to your local Rivar Sand and Gravel outlet today to learn more?